What to expect on your first day of nursing school? So I do not magically know when you are starting nursing school, so I wanted to post this ahead of time. First, congratulations on getting into nursing school!! It is a journey, but together we can do it. 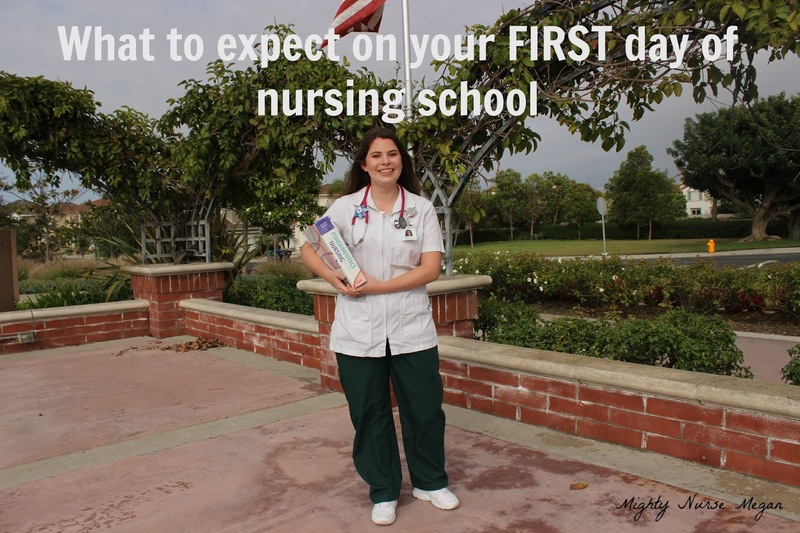 Here is what to expect on your first day of nursing school. ONE// You are going to be nervous and not sure what to expect. So just try and get a good nights rest the night before and bring the items that was requested of you. Also, eat breakfast in the morning so that you are awake and alert for the day. For my first day I had my binder with the syllabus printed out, the powerpoint printed out in note form, and my textbook (even though we did not use it). My nursing class did not waste time by going over the syllabus because we did that the day before at our orientation. They also expect you to have already looked over the syllabus and read the chapters that were being covered that day. TWO// There is a good chance that you will have homework. Nursing school homework is not like regular homework though. Usually it is reading the chapters that are going to be discussed the next class. And if you already read my tips then you know that reading the chapters is extensive. I personally do not read the chapters, but that does not mean you should not come prepared to class. Instead you can skim through the chapter making sure to pay attention to bold or highlighted parts, diagrams, and charts. Additionally, if your professor posts their powerpoint beforehand than glance through that! I suggest reading the chapter following a lecture only for clarification of items. THREE// You can expect to be overwhelmed. Teachers are going to "throw at you" a ton of due dates of exams, projects, papers, labs, and clinical days. Now is not the time to stress over the actual assignment. Jot down any important information they mention about it and revisit the assignment requirements outside of class as you are putting it in your planner. A lot of time teachers will mention during this time when they suggest starting an assignment. For example, in Adult Health 1 we had to do a well-elder project. The assignment required us to visit with a well-elder at least three times over a certain period of time. Knowing these time requirements, I had to plan ahead. The teacher suggested doing it over a holiday break because that gave us some time after to write the paper before it was due. Overall, my first day of nursing school was exciting. I finally was a nursing student and felt accomplished getting in. I sat next to a close friend who I knew would not be a distraction during the lecture. I had previously read the syllabus and knew what assignments were expected of me which relieved some anxiety. I do not recall anything terrible happening. So I guess it was good. The first day goes fast so try and enjoy a part of it. When the day is over you might be feeling stressed. Please just breathe because you CAN get through it. If you need anything, know that I am here. Honored to have a personal shout out, Might Nurse Megan! These are incredible tips. I remember my first day in Adult Health; I was already completely overwhelmed with assignments, due dates, and reading. I spent maybe the first half of the semester trying to keep up with reading, but it's nearly impossible to do 100+ pages of reading for one class in two days. I learned that skimming, chapter headers, and PowerPoint lectures were my best friends. Mighty Nurse does it again! So will you being doing a guest blog post for us? Thanks for the post. My orientation is this Wednesday and I start my first semester on the 17th. Any suggestions on what to bring to orientation....or what is covered at orientation? Congrats! That is so exciting! For my orientation they mainly went over the class syllabus and the school of nursing handbook. They also had some previous year students share their study tips. Our student nurses association was also there selling tickets to their bootcamp, calculators, and pen lights. We also had a book rep come to teach us how to use the evolve website to access our ebooks. At the end of our orientation we received our clinical skills bag and had to take a critical thinking exam thanks to ATI. From what I remember it was dragged out way to long, but just meant the first day of class we went over actual material. I would suggest bringing a planner and your laptop/tablet or a notebook and pen. Also, snacks and water! Overall just be prepared to listen to a lot of information being thrown at you. But remain clam because you can get through this! I also received the black scrub set. It is just like the white set except that the white set has slits at the ankles. The black womens scrub tops does not. The color of the black is very nice too. I am enthusiastic about joining a Nursing College in my city and become and a well-qualified and trained nurse after completing the studies. I will help me to serve the society in a better way.